The smelling table and Now Sipping wall. Pic; Holly Patrick. At the forefront of the loose-leaf tea revolution stands T2, an Australian tea company who uprooted themselves from Melbourne and nestled in Shoreditch. Just a short walk from Shoreditch High Street station, the UK’s first store is hidden away on Redchurch Street, and offers customers over 150 types of both loose leaf and bagged teas. My brewing expert for the morning was Emma, who’s been with the company for six years – she even moved over from Australia to continue the T2 philosophy. She explains the story behind T2 to me as I sip on one of their white teas, Pai Mu Tan. The company began in Melbourne, as the brainchild of entrepreneur Maryanne Shearer, who originally wanted to start a homewares business but branched out into the world of tea instead. 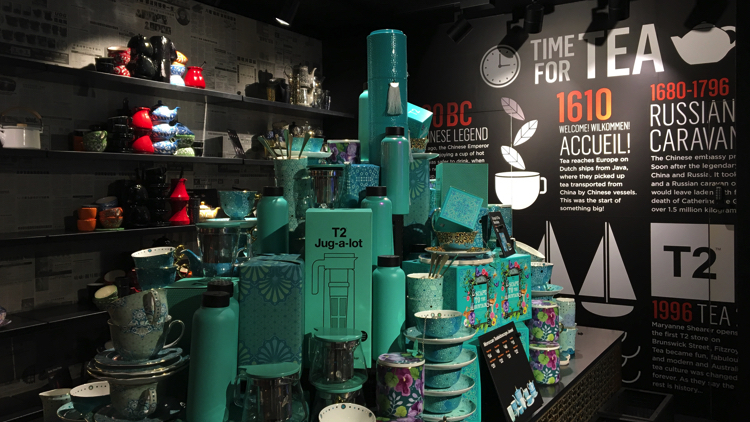 Every store has a Now Sipping wall with new favourites and classic blends, a smelling table at the front of the store, and a plethora of tea makers and crockery to take home. “The Now Sipping wall will change as our favourites do – at the moment it’s a Mother’s Day gift set, but we also have matcha on there because it’s one of our best products and very ‘in’ right now,” Emma said. Matcha tea. Pic; Holly Patrick. 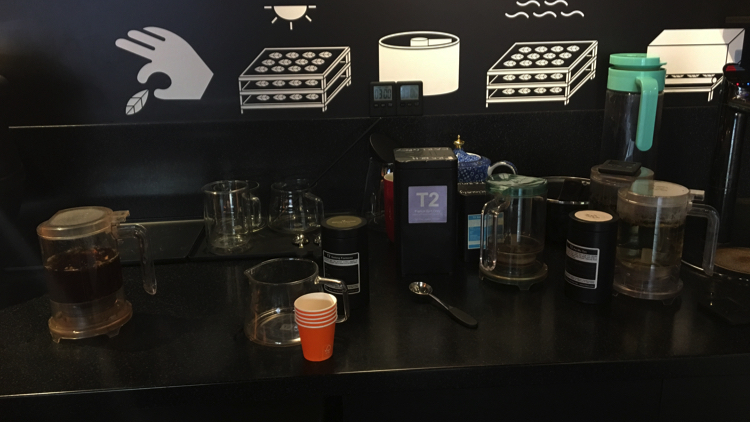 Walking into a T2 store, customers are offered a completely unique experience to that of any standard tea shop. Its blackened steel interior sets it apart from the rest; the dark, stripped interior is more like a tea library rather than a store and that is what defines them. Greeted by a friendly tearista, I am invited to discover the ‘smelling’ table at the front of the store to learn about the types of tea on offer, browse the huge wall of teas, and even make some myself on the tea bar. Emma explains the tea-making process to me, something that she says not many people know about. 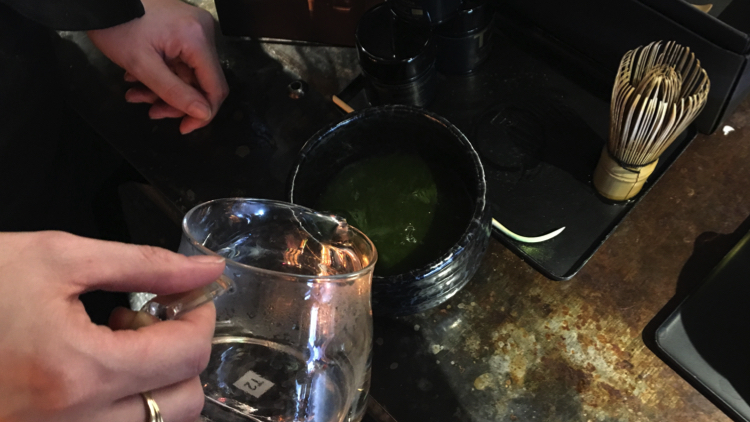 Brewing matcha tea. Pic; Holly Patrick. 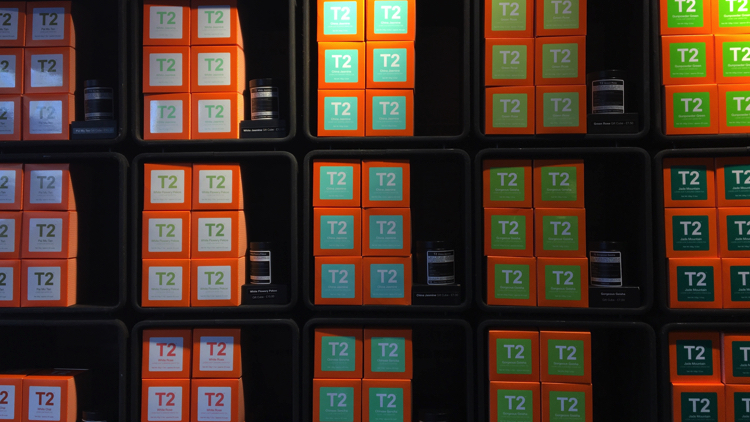 Although T2 offers a vast range of teas, they keep track of what’s trending. 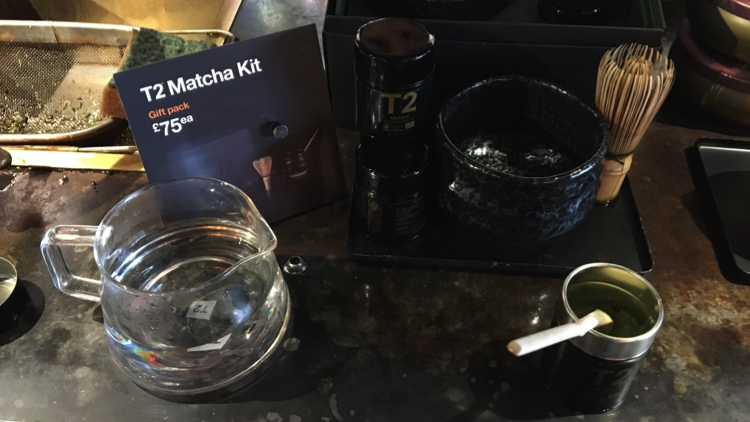 I’m invited to try their ceremonial grade matcha tea, a Japanese tea ceremony drink that’s popping up in coffee, tea and even food. “Matcha is everywhere at the moment!” Emma laughs. The tea wall. Pic; Holly Patrick. Brewing loose leaf tea. Pic; Holly Patrick. 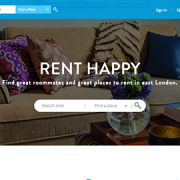 Flat-sharing made personal, welcome to Ruumi. great stuff,feeling inspired to go and try out some new flavours. 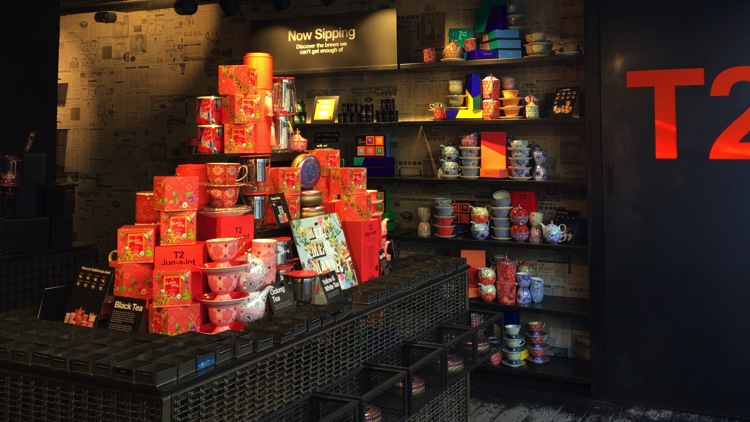 Visited T2 on TCR to pick up some gifts for last Christmas, and it’s great to see a modern touch being put back into tea. No such thing as a humble tea bag here! I didn’t know they originated from Australia though. As the new wave of coffee seems to be associated with NZ, will we see a new generation of tea credited to Australia?